DOLCE Club is bringing back the spirit of the 90s. 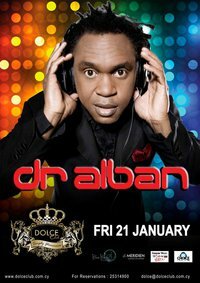 Introducing for the first time in Cyprus… DR ALBAN… Performing his most famous hits live. These include “Its My Life”, “Look Whos Talking”, “Sing Halleluah”, “Hello Africa” and more. Its going to be a night full of memories! Event created by Dolce Club on facebook and submited by Nicolas Georgiades to OnThisIsland.com using the Cyprus Events Application .